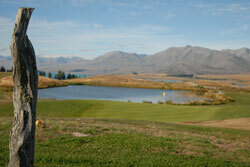 The Cairns Golf Course - Lake Tekapo. Activites with Tekapo Tourism. It was the wide open spaces that first brought the pioneer farmers up into the Mackenzie Basin. Large station runs were established with sweat and dog, beginning the Mackenzie's long and on-going association with the high country sheep station. Lake Tekapo was formed thousands of years ago when the glacial ice from the last ice age retreated, leaving behind a natural dam of rock debris behind which the lake was formed. It was on this ancient debris that Mt John Station was established and from the station's high points, stunning vistas of Lake Tekapo and the Mackenzie are a delight to behold. It is from this high country run that the Cairns Golf Course has been established. The 9 hole Cairns Golf Course originates at the stables - Le Stables - of the historic Mount John Station. A small shop operates from Le Stables and in addition to providing club hire to those who travel light, the shop also displays and sells a stunning range of clothing, textiles and products, many of which are from the sheep and alpaca from the neighbouring Balmoral Station. The overwelming theme of the Cairns Golf Course is in keeping with tradition and the area's history. Designed by Barry Johnston and Simon Forshaw, the course follows the unmodified contours of the glacial moraine, come high country run. The fairways twist and stretch through tarn (high country lake) and brow. The Cairns Golf Course is in keeping with tradition and the area's history. Designed by Barry Johnston and Simon Forshaw, the course follows the unmodified contours of the glacial moraine, come high country run. 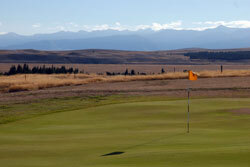 Golfers playing the fairway to the highest green with its uninterrupted vistas of the Mackenzie Basin and the Ben Ohau Range, will be oblivious to the raging waters deep beneath them as the water of Lake Tekapo passes through a tunnel from lake to power station on the start of its journey through the Waitaki Hydo Power scheme. 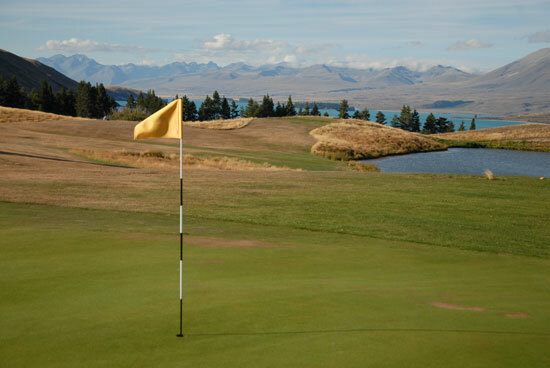 Whether it be the game on a course tilled from the earth, or played amongst alpine scenery, some of the best New Zealand has to offer, The Cairns Gold Course will offer you a mixture of pleasure and tradition.